Posted July 11, 2016 by admin & filed under Bad Breath, Diseases and Treatments, Family Dental Care, General Dentistry, Teeth Care. You can chew on a piece of Ginger, for at least one minute and you’ll get fresher breath. Be sure to drink water after you spit out the ginger. Or if you prefer, you can dice freshly washed ginger and blend it with hot water for a warm beverage. Cinnamon has natural antimicrobial agents, therefore it can kill bacteria in your mouth. If you chew on a cinnamon stick after eating garlic, it will release essential oils and absorb the sulphorous odors and garlic taste. You can also create a quick Cinnamon mouthwash by adding a teaspoon of cinnamon into hot water along with a dash of honey. Gargle with it in the morning and it will help keep your breath fresh throughout the day. Some foods cause indigestion and can lead to gases being emitted through our mouths, leading to bad breath. Eating avocados can help decompose some of the intestinal bacteria that remain in our guts due to indigestion. You can get rid of bad breath by chewing on a peppermint or spearmint leaf. It can also help if you have indigestion or heartburn! Another fresh breath remedy includes apple cider vinegar. It has acetic and malic acids which break down odor forming bacteria in our mouths. Add a ½ teaspoon of apple cider vinegar to hot water and gargle for 10-15 seconds. Cumin is a spice used in Indian and Mexican foods, but it can also help cure bleeding gums, laryngitis, oral ulcers and halitosis. Combine a cup of boiling water with one teaspoon of Cumin seeds. Strain and cool the water, and then gargle with water twice a day. You could also chew 20-30 Cumin seeds after a meal, but the seeds can be fairly pungent. Parsley is a natural breath freshener. You can chew on a sprig of parsley or make a hot tea with two cups of boiling water and crushed parsley leaves. The chlorophyll in parsley absorbs the odors in our mouths. 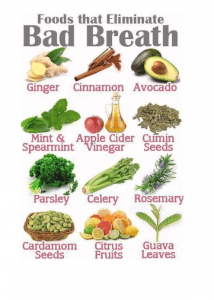 Rosemary, Cardamon, Basil, Coriander, Dill, Thyme, Tarragon and Cilantro can offer similar breath-freshening features. You get a two-fer with fresh vegetables like celery, carrots, broccoli, apples and pears. These fiber-rich foods fights halitosis by absorbing the bacteria and sulphur which causes bad breath and they help generate more saliva which washes away film on our teeth, which cause plaque. So, it’s also a good way to help keep your breath fresh, your teeth white and get healthy nutrition, too! Strawberries, kiwi, and citrus fruits that have Vitamin C are also good for your teeth because they keep the bacteria at bay and are good in preventing periodontal disease and gingivitis. 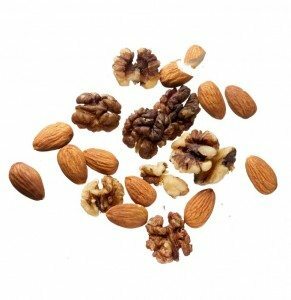 Another healthy snack that’s good for our teeth are almonds, walnuts and pecans. These abrasive, hard foods help rub off plaque and stains from the surface of the teeth. Plus, they’re full of protein and healthy fats. So crunch away and see a healthier, whiter smile! Be sure to visit Modern Family Dental Care on a regular basis, so we can help keep your breath fresh and your teeth pearly white!